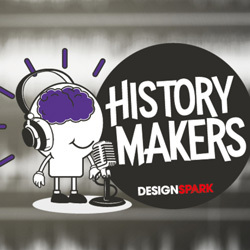 RS Components has launched a new comedy podcast series called History Makers. The series explores a modern-day technology theme, such as artificial intelligence, Wi-Fi or 3D printing, and examines the lives of the great inventors from past centuries who made it possible, with laughs along the way. Robot Wars judge and DesignSpark blogger Dr Lucy Rogers hosts the podcast alongside award-winning comedians Harriet Braine and Bec Hill. Each episode takes a famous maker from the past face-to-face with innovative technology from the present day through a mixture of facts, jokes, sketches and songs. The presenters pay respects to the struggles and triumphs of makers who went before and reflect on whether the inventions that developed after them are as beneficial as we think.